This article is about the year 1822. For the book by Laurentino Gomes, see 1822 (book). Wikimedia Commons has media related to 1822. January 1 – The Greek Constitution of 1822 is adopted by the First National Assembly at Epidaurus. January 7 – The first group of freed slaves from the United States arrive to the west coast of Africa, founding Monrovia on April 25. January 9 – The Portuguese prince Pedro I of Brazil decides to stay in Brazil against the orders of the Portuguese King João VI, beginning the Brazilian independence process. January 13 – The design of the modern-day flag of Greece is adopted by the First National Assembly at Epidaurus, for their naval flag. January 14 – Greek War of Independence: Acrocorinth is captured by Theodoros Kolokotronis and Demetrios Ypsilantis. February 6 – Chinese junk Tek Sing sinks in the South China Sea, with the loss of around 1,600 people on board. February 9 – The invading Haitian forces, led by Jean-Pierre Boyer, arrive in Santo Domingo, to overthrow the newly founded Dominican Republic. February 24 – The first Swaminarayan temple, Kalupur Swaminarayan Mandir at Ahmedabad in the British Raj, is inaugurated. 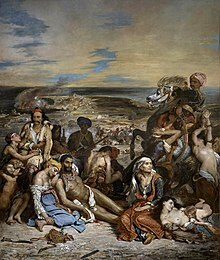 March 31 – Greek War of Independence – Chios massacre: 20,000 Greeks on the island of Chios are slaughtered by Ottoman troops, and 23,000 exiled. May 24 – Battle of Pichincha: Simón Bolívar secures the independence of Quito. May 25 – Christos Palaskas and Alexis Noutsos are executed by Odysseas Androutsos' forces. May 26 – Grue Church fire: 116 people are killed, in the biggest fire disaster in Norway's history. June 6 – Alexis St. Martin is accidentally shot in the stomach, which leads the way to William Beaumont's studies on digestion. June 18 – Greek War of Independence: Constantine Kanaris blows up the Ottoman navy's flagship at Chios, killing the Kapudan Pasha Nasuhzade Ali Pasha. July 3 – Charles Babbage publishes a proposal for a difference engine, a forerunner of the modern computer, for calculating logarithms and trigonometric functions. Construction of an operational version will proceed under British Government sponsorship (1823–32), but it will never be completed. July 8 – The Chippewas turn over a huge tract of land in Ontario to the United Kingdom. July 13 – Greek War of Independence: Greeks defeat Ottoman forces at Thermopylae. July 26 – Guayaquil Conference: José de San Martín arrives in Guayaquil, Ecuador, to meet with Simón Bolívar. July 27 – Guayaquil Conference: Simón Bolívar and General José de San Martín meet in Guayaquil, which Bolívar later annexes. July 31 – The last public whipping is carried out in Edinburgh. August 12 – St David's College (the modern-day University of Wales, Lampeter) is founded in Wales by Thomas Burgess, Bishop of St David's. August 15–29 – The Visit of King George IV to Scotland takes place. August 22 – English ship Orion lands at Yerba Buena, now named San Francisco, under the command of William A. Richardson. September 7 – Brazilian independence: Brazil declares its independence from Portugal. September 8–13 – Battle of Nauplia: In a series of naval engagements, the Ottoman Fleet fails to break through the Greek Fleet, under Admiral Andreas Vokos Miaoulis. September 11 – Galileo Galilei's Dialogue Concerning the Two Chief World Systems (1632) is permitted by the Roman Catholic Church to be published. George Canning is appointed British Secretary of State for Foreign Affairs. The Constituent Congress of Peru begins its first session. September 22 – Portugal approves its first Constitution. September 27 – Jean-François Champollion announces his success in deciphering Egyptian hieroglyphs, using the Rosetta Stone, in a letter to the Académie des Inscriptions et Belles-Lettres in Paris (based on the work of Thomas Young). October 8 – The Galunggung volcano erupts on West Java, and is followed four days later by a second, more violent outburst; the two events kill more than 4,000 people and destroy 114 villages. October 12 – Pedro, Crown Prince of Portugal, is declared the constitutional Emperor of Brazil, as Pedro the First. October 31 – Emperor Agustín de Iturbide of the First Mexican Empire dissolves the country's Congress of the Union, and replaces it with a military junta. October–December – Congress of Verona: Russia, Austria and Prussia approve French intervention in Spain. November 9 – Action of 9 November 1822: USS Alligator (1820) engages three pirate schooners off Cuba, as part of the West Indies anti-piracy operations of the United States. Greek War of Independence: Nafplio falls to the Greek rebels. The Congregation of St. Basil founded in France. November 19 – An earthquake near Valparaíso, Chile kills around 200, causes a tsunami and raises the coastal area. November 22 – A fire in Guangzhou (Canton) kills 500 people, and destroys 13,070 homes and several European-owned businesses. December 1 – Pedro I is crowned, as the first Emperor of Brazil. The Rocky Mountain Fur Company (Ashley's Hundred) leave from St. Louis, Missouri, setting off a major increase in fur trade. Coffee is no longer banned in Sweden. ^ Dadrian, Vahakn N. (1999). Warrant for Genocide: Key Elements of Turko-Armenian Conflict. New Brunswick: Transaction Publishers. p. 153. ISBN 1560003898. ^ Hyman, Anthony (1982). Charles Babbage: pioneer of the computer. Oxford University Press. p. 51ff. ISBN 0-19-858170-X. ^ Prebble, John (1988). The King's Jaunt: George IV in Scotland, August 1822 'One and Twenty Daft Days'. London: Collins. ISBN 0-00-215404-8.